There are a few different ways to clean your George Foreman Grill. However, I feel obligated to start this post by telling you how NOT to clean a George Foreman Grill. A family member recently used a scouring pad to clean her Foreman Basic Grill. She scraped the non-stick coating right off of the grill and basically ruined it. Another thing you should not do is submerge your entire grill unit in a sink full of soapy water. This could damage the heating elements. You will find YouTube videos of people giving their Basic Grills a bath. I don’t recommend that other than for removable plates. So, how should you clean a George Foreman Grill? Let’s review this by looking at the different types of grills. Not all Foreman Grills are created equal. However, some of the methods for cleaning will work for all of the electric grills. There are a few different ways to clean the Basic Grills. Choose one of the 3 methods that will be the safest and easiest for you. 1. After using the grill, unplug it. While it is still hot, place a ball of wet paper towel in your non-metal tongs. Wipe down the hot grill surfaces to get as much grime and debris off of the plates, being careful not to burn yourself. This works well to get in-between the ridges. Enjoy your meal while the grill cools down. Once the grill is cool, take a soft sponge with mild soapy water and really wipe the inside of the grill, being sure to wipe the edge where any fat as dripped. Wipe again with a clean sponge with only water to rinse away any soap residue. Then, wipe the outside with a wet sponge. You can also dry the grill with a soft dish towel. The drip tray can be cleaned by hand with soapy water and rinsed. Or, it can be placed in the dishwasher. 2. While the grill is still warm, but not very hot, place about 3 layers of damp paper towels on the bottom plate and close the lid. The steam that forms will help to loosen the food particles and char. Once the grill has completely cooled down, clean it grill with mild soapy water and a soft sponge. Rinse it with just water on a sponge, inside and out. My personal experience with this method is that it turned my kitchen into a steam bath. And, the paper towels dried out quickly. It did loosen some of the food particles. 3. Use parchment paper or aluminum foil to line the grill before cooking on it. You will need a piece that is large enough to cover the bottom plate and to fold over your food to protect the top plate. This prevents to grill plates from accumulating any food particles. When the grill is cool, just toss the foil or paper and wipe any debris or liquid that might have spilled onto the plates with a soft wet sponge. The Advanced Grills and Panini Presses have removable non-stick coated or ceramic plates. Removable plates can easily be cleaned by submerging them in a sink with warm soapy water. Let them soak to loosen food debris. Then, scrub them with a soft sponge. Rinse and allow the plates to dry before putting them back in the grill. Clean the drip tray the same way. The removable plates, both coated and ceramic, are dishwasher safe. The plates on the Advanced Grills are sized perfectly to fit in the bottom rack of the dishwasher. The drip tray can also be placed in the dishwasher on the top rack. To avoid cleanup, these plates can also be lined with either aluminum foil or parchment paper before cooking. Wipe the exteriors with a wet soft sponge and dry with a dish towel. The Premium Grills can be cleaned similarly to the advanced grills, either with warm soapy water or by placing the removable plates and drip tray in the dishwasher. However, some reviewers claim that certain plates are harder to clean, especially the waffle plates. People report that the batter gets stuck in the grooves. The best solutions I have found for this is to make sure you coat your grill and waffle plates well with cooking oil or butter before use. After cooking, place them in a sink of warm soapy water for an hour. You can run them through the dishwasher after that. For stubborn food debris you can try using your plastic tongs to loosen it. Be as gentle as possible with the non-stick coated plates. The griddle plates, muffin cup plates, and the baking pan are relatively easy to clean by hand with soapy water and a soft sponge. I recommend using individual paper baking cups to line the muffin plate and parchment paper when using the baking pan for things like brownies and corn bread. It is not recommended that you clean the top broiler element. Yet, I think it is fine to completely cool the unit and then wipe the reflector clean with a damp paper towel. As with all the grill units, wipe the exterior clean with a soft wet sponge and towel dry. Some of the Indoor/Outdoor grills have a non-stick coating while others are ceramic. Both can be cleaned with warm soapy water and a sponge. Then, rinse them off. What I think works best is to first carefully wipe down the grill surface with a wet paper towel placed in plastic tongs while the grill is still hot. After the grill cools down, remove the grill section form the stand (if using the stand) and clean it with mild soap and water on a soft sponge. Then, rinse it off well without getting the electrical connection wet or submerged. You can do this with any of the following methods. Wipe down well with a clean wet wash cloth or sponge. Place the grill plate section vertically in your sink and rinse it with the faucet sprayer, avoiding getting the electrical element wet. Rinse with an outdoor hose on low flow. The lid can be wiped clean the same way. If the lid has a temperature gauge, be careful not to damage it while cleaning. The drip tray can go into your dishwasher or be submerged in soapy water and washed by hand. Dual-Surface Griddle & Grill (Model: GFG240X) has a premium ceramic surface that makes clean-up a bit easier. Yet, there seems to be a little confusion about whether the plate is removable or not on the manufacturer’s website. So, I reached out to some users on another website and most people affirmed that the 2 drip trays are the only removable parts. With that in mind, you would clean this grill the same way you would the Basic Grills with non-removable plates. The drip trays are dishwasher safe. Similar to the Basic Grills, Foreman Quesadilla Maker does not have removable plates. Most users and reviewers recommend just wiping down the surfaces with a wet paper towel when the unit has cooled down but still warm so as not to disturb the non-stick coating. 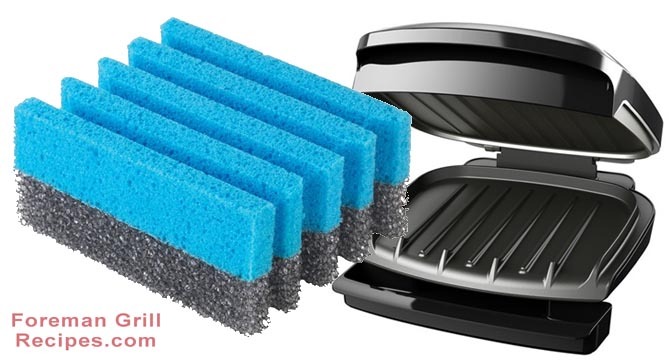 There are sponges that are specifically designed for cleaning the George Foreman Grills. These have a nylon scouring surface and a soft surface. They are sized to fit in-between the grill ridges of the basic grill plates. From my own experience, I have found that cleaning the grill soon after using it is the smartest way to go. When I see photographs of grills that are claimed to be “ruined” by scorched food debris it appears to me that the grill was left to sit and the debris hardened. Always unplug or turn off your grill as soon as you finish cooking on it so that food left behind will not continue to cook and harden. I recommend wiping down any of the grill plates while they are still warm. Leave the drip tray in place to catch any food particles that you are wiping down. Place removable plates in a sink of warm soapy water to soak, even if you plan to run them through the dishwasher. The drip trays are a snap to clean with soap and water or on the top shelf of the dishwasher. While the non-stick coatings and ceramic surfaces boast of being able to cook without using fat, I have found that a little bit of cooking oil or butter really does help with the clean-up. Never use harsh chemicals or metal to clean the grill surfaces. And, always use plastic, nylon, or wooden utensils so as not to scratch the coating. Does your grill smell of the food you cooked on it, especially fish? Simply take 1/4 of a lemon and rub the clean plates with it and rinse with a wet sponge or water from the faucet sprayer. This should get rid of the odors. I’ve found that a simple solution of water vinegar and a little dish soap in a spray bottle works awesome! I spray the grill either right after cooking or after it has cooled then using a soft sponge with a little dish soap I wipe any food particles or grease residue away. After a few wipes with a clean sponge the grill is as good as new. Also prop the grill on the edge of the sink so the water, soap, food and grease residue fall into the sink. When i’m done I usually spay once more and wipe clean with a paper towel. I recently purchased a Foreman grill with removable plates. Loved the idea, since my previous grill was a test of patience to clean. However, when I grill burgers the smoking is unbearable and my whole house reeks for days. I have read and followed the directions for grilling hamburger, but it continues to be an issue. It is unusable as it is now. Any suggestions? If I had known how difficult it would be to keep these removable ceramic plates clean I would never have purchased this. I always used the non-removable George Foreman which was much better. So frustrating when you don’t have a dishwasher and spend over 15 minutes and still can’t get them clean!! Ready to throw the thing out. Hi I just purchased the George Foreman copper grill with removable plates. Just wondering if it’s okay to use the George Foreman grill sponges to clean the copper plates? Use oil on ceramic plates and I clean fairly soon after cooking with sponge and plastic abrasive plus a stiff toothbrush I bought to get into crevasses. Cooking is great but caution – it only takes a few minutes for a thick steak, chicken and especially good for frozen burgers. That means, for example, you can quickly cook up while your first steak rests and all are done in a timely way. I have had three GFG’s over the years and wouldn’t be without one. Frozen giant prepared.shrimp are awesome but again, it takes only minutes..Good luck and it’s a poir carpenter who blames his/her tools.